Nea Ovens graduated in 2001 with a Bachelor of Health Science (Acupuncture) at the Australian College of Natural Medicine, Brisbane. In 2002 she began practicing at Nurture Studio. Nea is an accredited member of the Australian Acupuncture and Chinese Medicine Association (AACMA). Nea uses specifically chosen acupuncture points according to your TCM pathology, suggests attainable diet and lifestyle changes, and if required will incorporate Chinese herbs, massage, cupping and moxibustion into your treatment. Nea is experienced in treating conditions in the following areas: Male and Female infertility; Morning sickness, reflux, and other discomforts associated with pregnancy; Womens health - period pain, endometriosis, irregular cycles, PMT; Musculoskeletal problems/injuries - neck pain, frozen shoulder, lower back pain, sciatica; Digestive disorders - chronic diarrhea, constipation, abdominal bloating; Insomnia; Anxiety, panic attacks, depression; Autoimmune disease maintenance; Urinary disorders; Common cold and sinusitis; General health maintenance. 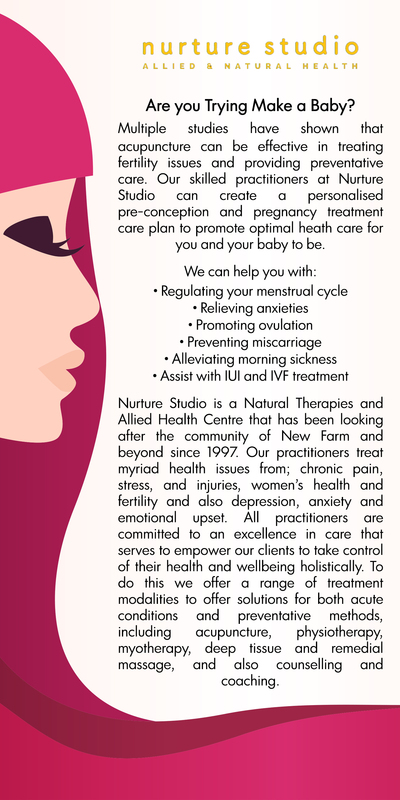 Please call Nurture Studio on 07 3254 3834 to speak to Nea or to make an appointment. CHINESE MEDICINE & ACUPUNCTURE FOR FERTILITY, PREGNANCY AND POST-NATAL SUPPORT. Chinese Medicine is clinically demonstrated to; assist in optimising fertility, reduce the likelihood of complications in pregnancy, alleviate common complaints experienced in pregnancy and aid in recovery from childbirth. Did you know that one in six Australian couples experience difficult in conceiving naturally? Acupuncture has a long tradition in being used to optimise fertility and improve natural conception rates through the regulation of the menstrual cycle. Further, in cases where natural conception is not happening, Acupuncture is widely used as a supportive therapy to IVF treatment with scientific studies illustrating the increased chances of pregnancy in women receiving Acupuncture concurrently.